Every year hordes of holidaymakers flock to the sun-kissed beaches of the southern Algarve but Portugal’s Silver Coast is hot on its tails as the European holiday destination, not less because of its stunning natural beauty. It’s Portugal how it should be, lush greenery, quaint hilltop villages and even the odd donkey. It’s not only establishing itself as a holiday hotspot, its also an interesting investment opportunity, despite Portugal’s financial woes over the past few years. 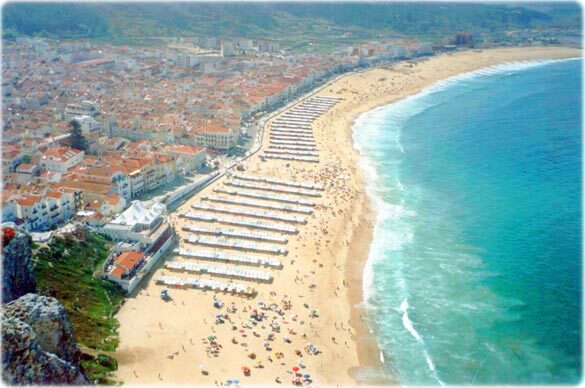 The so-called Silver Coast is a 150km stretch of truly spectacular coastline running up from the country’s capital Lisbon to Nazare, Portugal’s most famous fishing village. This area offers visitors a taste of the ‘real Portugal’ however cliché that may sound. Let’s get the only real negative out-of-the-way first before we dip into its splendour. 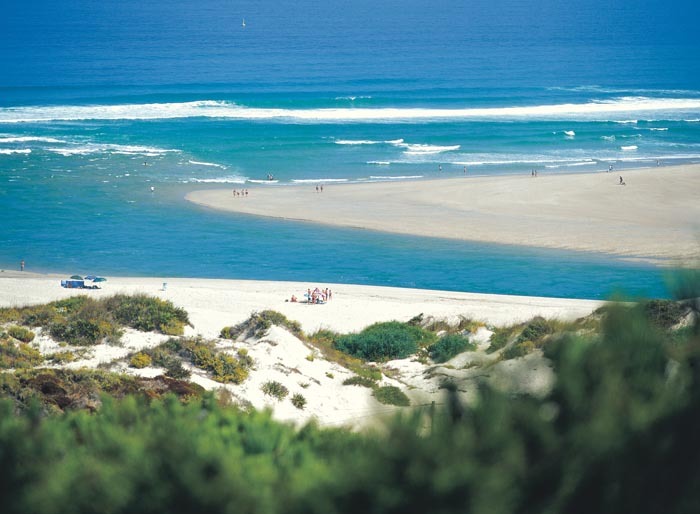 Due to its Atlantic coastline the climate is somewhat chillier than the South of Portugal as the currents cool the Summer heat but the upside to this is the spectacular waves on the beaches that attract surfers from all over the world and have earnt them the reputation as the ultimate global surfing destination. Being able to fly into either Faro or Lisbon makes this region easily connectable from all over Europe, the drive from the airport to the central towns of this area are under an hour. Óbidos is perhaps the most well-known area on the Silver Coast, which is why property developers have been tripping over themselves to build some of Europe’s most luxurious residential developments here. 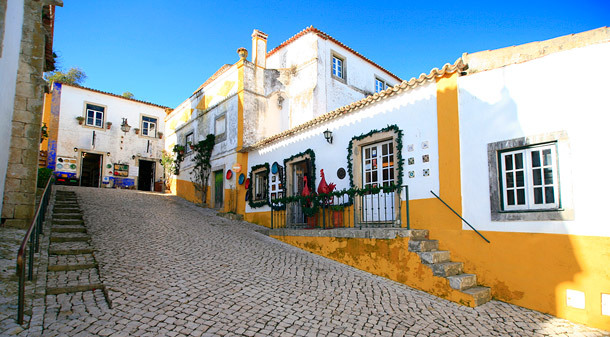 Óbidos a charming medieval walled village is a great place to start when visiting this region. Perched on a hilltop and encircled by a fortified wall, Óbidos is a well-preserved example of medieval architecture; it’s streets, stairs, walls and castle are a popular tourist attraction and this tiny village is often packed to its walls as tourists flock to the region. The labyrinth of cobbled streets and tiny craft shops make for a lovely day out, stop and watch the world go by from one of m any traditional restaurants lining the narrow streets. If you meander off the beaten track a little, away from the souvenir shops and street entertainers promoting the world-famous ‘chocolate festival’, you’ll be delighted and charmed by the adorable white-washed houses decorated precisely by oversized flower arrangements. 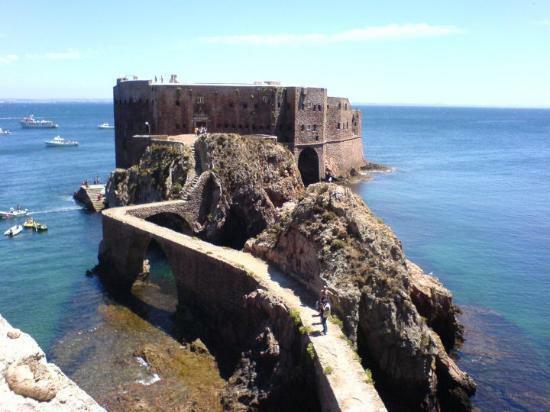 If you fancy staying in the area the Casa das Senhoras Rainhas nestled inside of the city walls is a pleasant option, however if you wish to be slightly further from the camera adorned visitors try the Praia D’El Rey Marriott is a welcoming family hotel with fantastic 5* facilities. A must visit is the Óbidos lagoon, one of the most beautiful spots on the entire Portuguese coast, a fragile ecosystem where many species call home. Staying around the lagoon is also a popular choice and a great base for exploring the area, The BomSucesso Golf Resort is a luxury development featuring a hotel and sprawling design villas available to rent which not only allows you to connect with the natural landscape around but the villas are actually built into it, disappearing from above into the rolling greenery. For something even more relaxing, The Óbidos Lagoon Wellness Retreat is a great vacation spot for those seeking a haven of tranquility and a little bit of respite from a busy life, with excellent spa and wellness facilities designed around an outdoor lifestyle. If you haven’t realised it by now, the Silver Coast is all about being outside and with scenery this stunning, you won’t want to be anywhere else. Nazaré is the other most well-known area of this side of Portugal, a picturesque seaside village , famous for its long sandy beaches and it made the headlines in 2011 when Hawaiian surfer , Garrett McNamara surfed a record-breaking giant wave: 78 feet from trough to crest. As you can imagine, the area is extremely popular with surfers. Further along the coast are the world-renowned surfing towns of Peniche. Peniche is built on a long rocky peninsula and its long, windy beaches are some of the most sought after for watersports, namely surfing. Supertubos, waves formed with very fast and powerful tubular movements, are very popular in the region and are considered of the best in Europe. With its cute working harbour (yes harbours can be cute), traditional white windmills, hidden chapels and of course stunning beaches, famous artists like Maruirce Boitel were inspired by this area and its not hard to see why. In the Summer months, take an excursion to the Berlanegas Islands around six miles offshore from the main peninsula. They’re one of the world’s first protected areas as a nature reserve. Just don’t forget your camera, the area is simply breathtaking! Everyone loves a hidden gem and the Silver Coast is simply full of them. 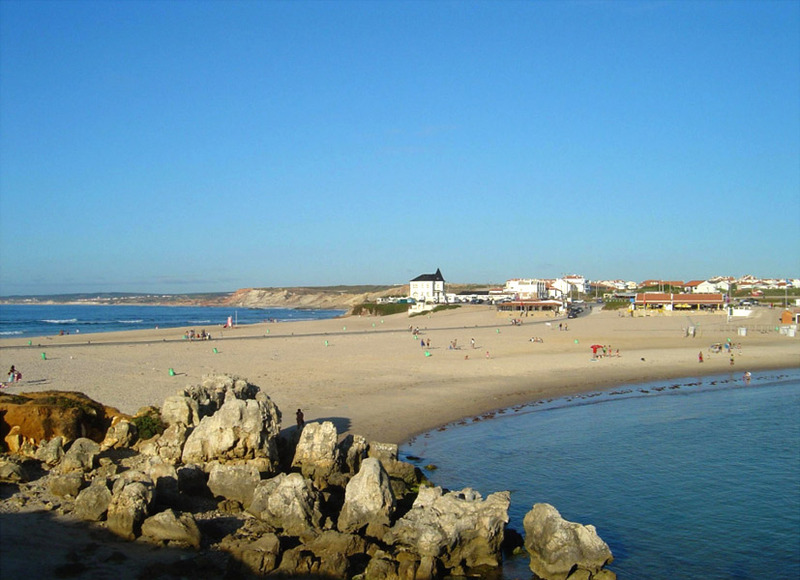 Baleal Island is definitely one, some 4km from Peniche. The island is separated from the mainland by a tombolo (or to you and I a low gravel beach), it’s a great vantage point for the coastline and what it makes up for in size it certainly makes up for in vista. If you simply haven’t had enough of absorbing the beauty of the area then a visit to Caldas da Rainha should be on your list. A busy market and spa town, it’s traditional Portugal through and through. With idyllic parks, street markets and even a boating lake, it’s easy to see why so many people have taken up residence here. The thermal springs in the area are renowned for having therapeutic qualities and have been utilised by the city’s thermal hospital, founded some 500 years ago and is one of the oldest institutions of its type in the world. As you wander around the streets, filled with traditional shops, stop and have a coffee in one of the many streetside cafes and restaurants offering up traditional Portuguese fare, you may notice the name of Rafael Bordalo Pinheiro repeatedly displayed in street names, museums, urban developments and displays of local crafts. Pinheiro was the founder of the ceramic industry in Caldas da Rainha, which the town is so well-known for. The Silver Coast is a mecca for the traditional, a sprawling nature reserve and historical point of reference that has seen tourists sit up and take notice, that being said the influx of visitors over the past decade hasn’t ruined its charm, in fact it has only worked to enhance it. The area is now an infusion of the traditional and modern luxury, it attracts film stars and indeed, film sets and is full of hidden treasures that make it perfect for those travelling who wish to see so much more than a shopping mall and a McDonald’s on their holiday. The beaches seem to go on forever, the scenery is beautiful, the villages picturesque and the sky is blue the entire year round. Perfection.